The Cardiac Sciences Institute was founded in 2006 and it comprises the following divisions; Adult Cardiology, Adult Cardiac Surgery, Pediatric Cardiology, Pediatric Cardiac Surgery and the Cardiac Rehabilitation Service. The latter is the largest in the UAE. The institute accommodates 15,000 hospital visits annually. The collaborative work that led to establishing this Institute under the auspices on SEHA has been paramount to its later success. The Institute has 31 adult cardiologists, 11 adult cardiac surgeons, 7 pediatric cardiac surgeons, 9 pediatric cardiologists and 36 catheter lab (invasive and non-invasive) personnel. It functions with the support of nursing staff, technicians, interpreters and administrative staff. The cardiac rehabilitation service has a staff complement of 7, including 5 physiotherapists. The invasive cardiology section has 5 invasive cardiologists, 8 catheter lab nurses and 1 radiology technician. The chairman of the Institute is currently the president of the Emirates Cardiac Society. The institute has performed surgical procedures for 2,800 pediatric and adult patients with congenital heart disease. Adult cardiac surgery has been carried out in 2,211 patients, additionally 1,429 heart rhythm devices have been implanted by the Electrophysiology service and 1,176 electrophysiological studies and ablations have been performed. Since its inception in 2006, the scope of available services has expanded significantly for certain subspecialties of cardiology, furthermore the Institute has clear future plans to introduce new services such as cardiac MRI, remote monitoring of heart rhythm devices and fetal echocardiography. Since 2010, members of the institute have published 78 manuscripts and 66 abstracts, many of which have been presented at prestigious international meetings. Active research programs are continuously pursued throughout the Institute. Thus, the latter establishment merits recognition as a Center of Excellence in its sphere of practice with contributions to teaching and training of resident doctors. The educational contribution of the Cardiac Sciences Institute includes the establishment of a Cardiology Fellowship and introducing burgeoning clinical research programs with meticulous attention to key performance indicators, and these are supported by policies and procedures in place. The Adult Cardiology Division is recognized by the American College of Cardiology as an International Center of Excellence. The Echocardiography Laboratory is the first in the country to be accredited by the European Association of Cardiovascular Imaging and the Institute is the first to be accredited as "Arab Board of Medical Specializations" being a "Center for a Cardiology Fellowship Program" to train young physicians. Accredited life support programs (BLS, ACLS and Pediatric ALS) are also in place. A Smoking Cessation program is widely offered to various bodies in the private sector as well as at universities and colleges. Notably, the institute has been in the forefront of newspaper campaigns advocating smoking cessation. 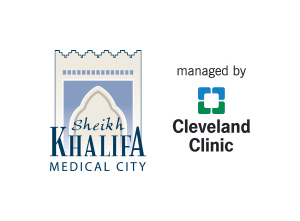 A number of awards have already been received by the Cardiac Sciences Institute during high profile international meetings such as Arab Health (2009) and Chest Pain Accreditation (2012). In recognition of the outstanding set of medical services provided by the Cardiac Sciences Institute of Sheikh Khalifa Medical City, the Institute is awarded the HAMDAN AWRD FOR OUTSTANDING CLINICAL DEPARTMENT IN THE PUBLIC SECTOR IN THE UAE for the Term 2015-2016.